pyBLoCXS is a sophisticated Markov chain Monte Carlo (MCMC) based algorithm designed to carry out Bayesian Low-Count X-ray Spectral (BLoCXS) analysis in the Sherpa environment. The algorithm may be used to explore parameter space at a suspected minimum using a pre-defined Sherpa model to high-energy X-ray spectral data. Use this thread if you are interested in conducting Bayesian Low-Counts X-ray Spectral (BLoCXS) analysis in the Sherpa environment. Last Update: 13 Dec 2018 - reviewed for CIAO 4.11, no content change. The pyBLoCXS code is a Python extension to Sherpa that explores model parameter space at a suspected minimum using a pre-defined Sherpa model to high-energy X-ray spectral data. pyBLoCXS includes a flexible definition of priors and can efficiently probe the model parameter space to characterize the posterior distributions. 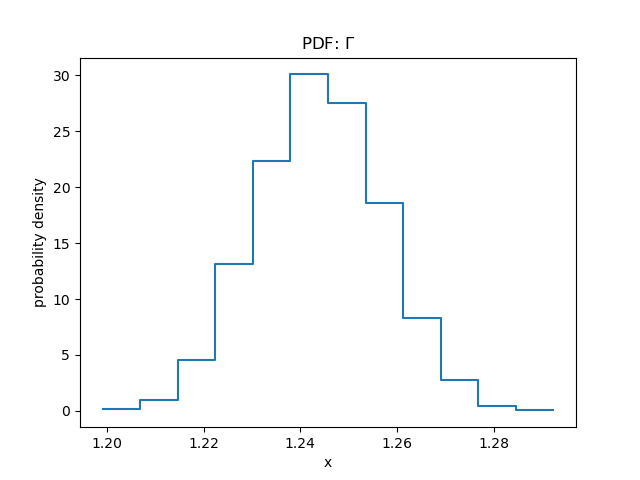 It allows for variations in the calibration information, and can be used to compute posterior predictive p-values for the likelihood ratio test (see Protassov, et al. 2002, ApJ 571, 542, Statistics, Handle with Care: Detecting Multiple Model Components with the Likelihood Ratio Test). The Sherpa get_draws function runs a pyBLoCXS chain using fit information associated with the user-specified data set(s) and the currently set sampler and parameter priors, for a specified number of iterations. It returns an array of simulated fit statistic values, an array of True or False accepted/rejected Booleans, and a 2-D array of associated model parameter values. Appendices A.2-A.4 of van Dyk, et al 2001, ApJ 548, 224, "Analysis of Energy Spectra with Low Photon Counts via Bayesian Posterior Simulation"
Please follow the Obtaining Data Used in Sherpa thread in order to obtain the sample data used in this thread. The spectral data products for the PKS 1127-145 quasar core are located in the pyblocxs sub-directory. The pyBLoCXS routine requires information about a fit to a data set in order to run; therefore, we begin by loading a source spectrum into Sherpa, fitting a model to it, and calculating confidence intervals on thawed parameters using the covariance method. The source spectrum is loaded with load_pha, and the source model expression to be used for fitting is defined with set_model. We decide to restrict the analysis to the 0.5-7.0 keV energy range, using the ignore command. We fit an absorbed power-law model to the data using the robust, Nelder-Mead Simplex fit optimization method and Cash fit statistic in order to select a Poisson likelihood as appropriate for pyBLoCXS simulations. Then, we estimate confidence intervals on all thawed parameters with the Sherpa covariance command. 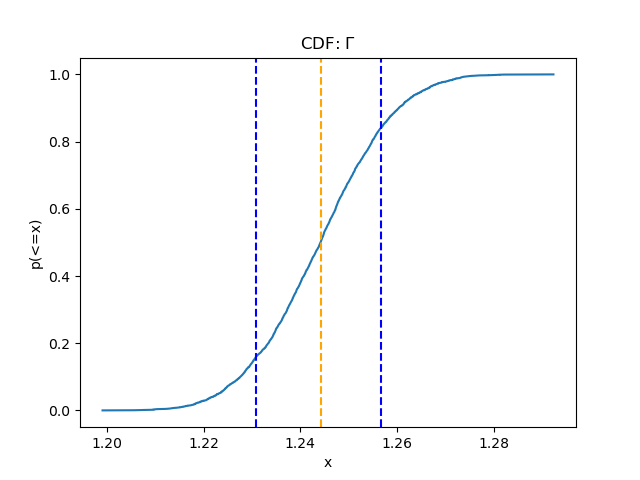 pyBLoCXS simulations are executed with the get_draws function, using the fit information associated with our specified data set(s)—and the current sampler and parameter priors—for a specified number of iterations. The simplest case uses the default MetropolisMH sampler, and flat priors for all parameters. The list of all available samplers is returned by the list_samplers function, and the currently set sampler may be viewed with get_sampler_name, as demonstrated below. The sampler—the type of jumping rule to be used in MCMC—can be either MH, MetropolisMH, pragbayes, or fullbayes (note that fullbayes is untested, new functionality and not recommended at this time). Metropolis and Metropolis-Hastings are the two standard algorithms for sampling the model parameter space (the posterior). Metropolis jumps to the new set of parameters from the current parameter set, while Metropolis-Hastings jumps always from the best fit. The Sherpa sampler MH is a pure Metropolis-Hastings, which always jumps from the best-fit. MetropolisMH is a mixture of Metropolis and Metropolis-Hastings, selected with a probability p_M. PragBayes is used when the effective area calibration uncertainty is to be included in the calculation. 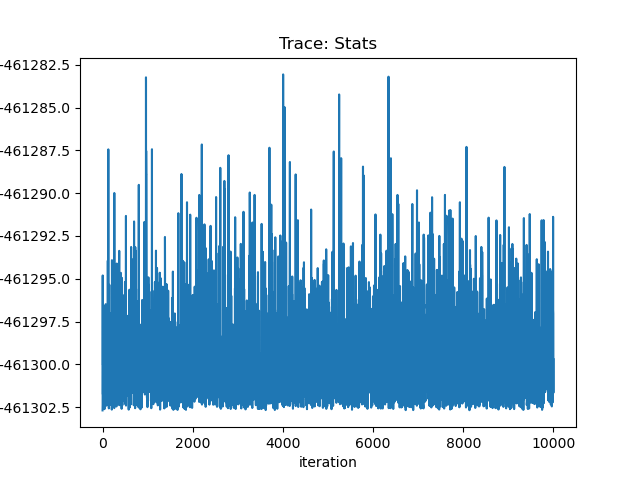 At each nominal MCMC iteration, a new calibration product is generated, and a series of N (option in set_sampler_opt) MCMC sub-iteration steps are carried out, choosing between Metropolis and Metropolis-Hastings types of samplers with probability p_M (option in set_sampler_opt). Only the last of these sub-iterations are kept in the chain. The get_sampler function is available for accessing the default settings of the current sampler, and set_sampler_opt for modifying those settings. We accept the default settings for the initial, simplest case and run the sampler using the get_draws function, specifying the names of the output arrays and the number of iterations. Here we use Python syntax to name the data arrays created by the simulations: stats, accept, and params. stats contains a 1-D array of floating-point statistic values; accept contains a 1-D array of True or False accepted/rejected Booleans for each iteration; and params contains a N-D array of parameter values, where N is the number of free parameters in the model. In this example, N is equal to 3. The plot_trace function can be used to plot by default the entire array of statistic values for each sample. We can use the associated get_trace_plot command to specify plot preferences, such as the desired value for line thickness, and then enter the name of the fit statistic array returned by get_draws into the plot_trace expression (stats) to create the plot. Finally, we can save the resulting plot to a PNG format image file with print_window. We can also choose to filter the fit statistic array and plot only a subset of the iterations—for example, elements 8000-9000—as well as plot only positive statistic values (Cash is defined as a negative value of the likelihood). By manipulating the params array in this way, we can access the simulation results for any of the three model parameters sampled. Below, we filter params to return all values for the first parameter, abs0.nH, and then again to return just the values for the tenth through twentieth iterations. 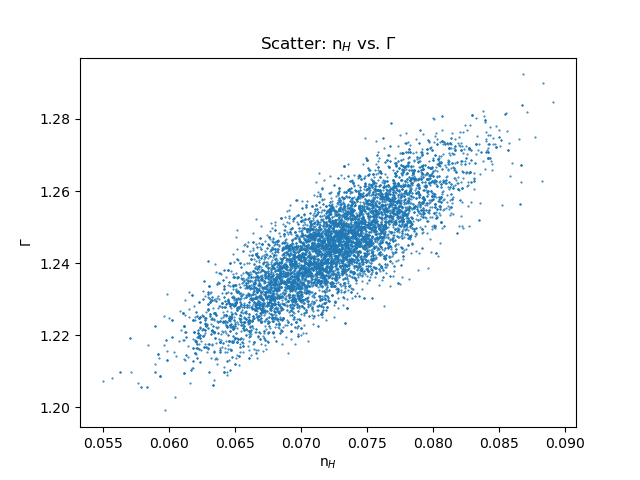 We can also display the values of the parameters in a scatter plot, showing correlations between different parameters. Here we display abs0.nH and p1.gamma, showing parameter correlation typical of an X-ray data set. 19 Mar 2015 updated for CIAO 4.7, no content change. 09 Dec 2015 reviewed for CIAO 4.8, no content change. 01 Dec 2016 reviewed for CIAO 4.9, no content change. 29 May 2018 reviewed for CIAO 4.10, no content change. 13 Dec 2018 reviewed for CIAO 4.11, no content change.